Many times when we think about creating a blog, we tend to put many gadgets, although many are not necessary, or perhaps only a few of them. In order to add the gadgets that we want, we need to have enough space. A solution would be to use an expanding/collapsing menu that is hidden and expands when the user clicks on it. Originally, this plugin called Sliding Login Panel was created so that users could register on the site, but as we know, in Blogger we don't have the option to add user registration, but that doesn't mean we can't take advantage of this plugin and use it to add other elements, such as a menu, search box, social icons, feed subscription etc. You can find a demo of this panel in this blog - just click on the Open menu link on the top. 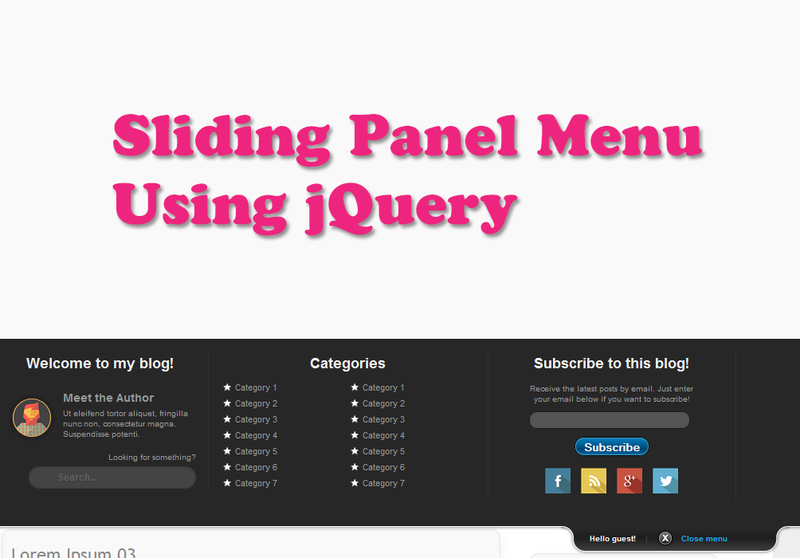 Here we have added the content in the sliding panel which will be hidden and will show on mouse click. In green are the names of each section so it is easier to recognize them. In the second section you have the categories - there add the URLs of your links by replacing the addresses in blue and replace Category 1, 2, 3... with the titles that you want to appear for the links. In the third section is the email subscription - just replace the text in blue with the name of your blog's feed. Please note that you must have this email subscription option enabled in your Feedburner account. As for the social icons below, change the URLs in blue with your Facebook and Twitte and add the URL of your blog's RSS feed address. Basically, these are the main sections that can be customized, but we can remove some of them and paste something else instead. Step 6. Save the template and that's it! Note that this menu works with jQuery, so if you are already using Scriptaculous, Prototype or Mootools, then it will not work. Hope you'll enjoy this elegant menu with sliding effect, which will look way better if we remove the Blogger navbar.